Okay, I’m just not the most tech savvy person out there, but I’m trying to merge my blog and the website clareaustin.com. With the help of the Cyber Kelpies, I might make this work. 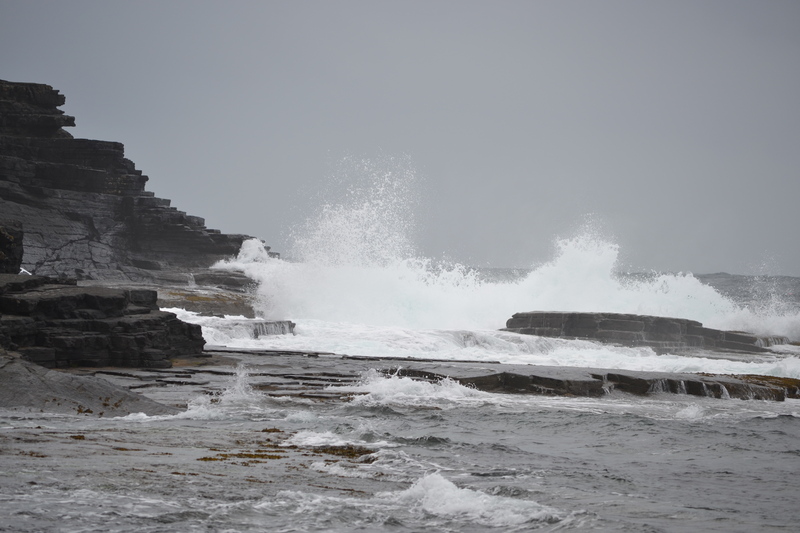 West Clare Coast. Worth saving? “Always,” he said. “What, exactly, did you have in mind?” His suggestive tone only added to her curiosity about him. They walked the short distance to where they had left the car. Ty tossed the picnic paraphernalia in the boot, grabbed his mandolin case and looped the strap over his shoulder. They strolled, hand in hand, back toward the cliffs. She tugged on his hand to draw him close. Ty hesitated. Ah, the brave and gallant Celt has an Achilles’ heel. “I swim…like a rock.” Ty’s smile turned strained. Ty swallowed his trepidation. If hanging off this feckin’ rock meant he was gettin’ lucky tonight, it was well worth the risk. Whomp. A virtual slap to the side of his head would have knocked him flat had he not already been prone. He’d rekindled his acquaintance with Muireann less than twenty-four hours ago. He’d either lied to himself or to her about why he was here. A lie by omission, but still not the entire truth. Ty had promised himself he wouldn’t deviate from his master plan. That plan, initially, did not include a woman—in his bed or his heart. “What am I looking at?” he asked, trying to distract his carnal thoughts. “You have to be patient. Watch the water, there, just beyond that solitary rock.” She nodded in the direction of a shallow pool. Ty tried not to think of the churning blue water and the three hundred foot drop. He gamely pushed back the memory of being caught in the tide and dragged out to sea, the struggle, and then the giving up. Twenty years had passed, and he still remembered clearly his battle for the surface of the water. “There. Do you see her?” Muireann whispered and pulled him back to the present. Muireann’s face softened and her lips turned up ever so slightly as she spoke of these animals. She reminded him of American girls’ reaction to puppies and newborn babies. The female need to nurture inspired an instinctual fear in the gut of most men, himself not included. When the time was right, Tynan would be more than ready for a nurturing female in his life. Ty loved her passion for this crusade but couldn’t see how things could change. “What can one person do?” This was the adult Muireann. The girl had become a woman with serious interests. She took some getting used to. Tynan could indeed sense her instinct to fight to the death for justice…or love. “You amaze me.” Truly she did. When she talked about saving seals, her love for the sea, when he saw her passion in the pottery she created, Muireann had that same charisma he had admired last night in O’Malley’s when she sang. It’s Coole! The autograph tree. Coole Park that is. The home of Lady Gregory, patroness to many of Ireland’s famous writers. This is the autograph tree. I thought it was appropriate, though somewhat presumptuous, to have my picture taken here. George Bernard Shaw, J.M. Synge, Sean O’Casey and, of course, William Butler Yeats all spent time in this garden. Who knows what inspiration came of it? Ireland’s beauty and her people have been an inspiration to me as well. In my novel, Selkie’s Song, now available in the Amazon Kindle store, I hope to have captured some of the legend, mystery, and romance of Ireland’s west counties. This village is Roundstone in English, but the Irish name is Cloch na Rón, Seal Rock. It reminded me of the village in my novel, Selkie’s Song, Ballinacurragh. 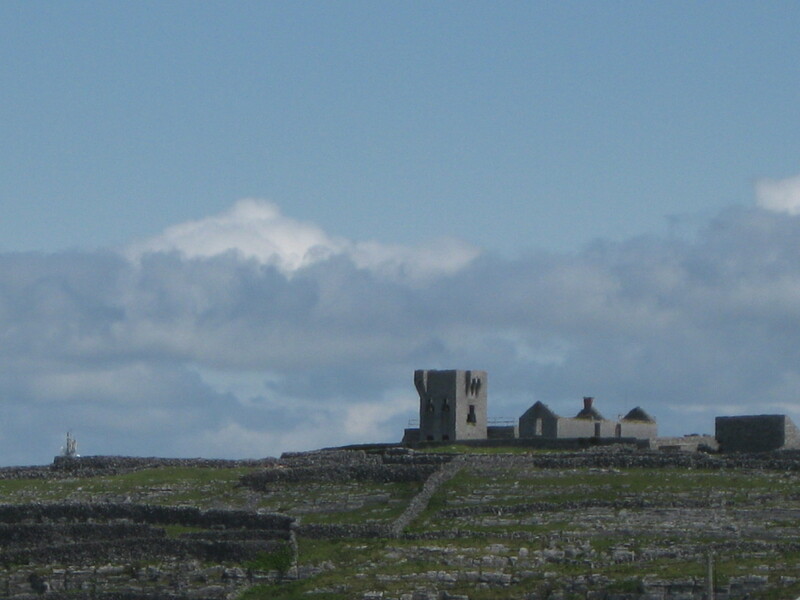 My setting is North Clare, but these coastal villages have a customary appearance. Seals are a frequent sight and the vulnerable shores and strands are in more jeopardy than ever. Muireann O’Malley, the heroine in my story, is a feisty environmentalist with a deep love of her country and culture. One might say the story is “ripped from the headlines” of Ireland today. Salmon farms, off shore oil drilling and industrial fisheries do threaten the ecosystems of this beautiful and fragile land. What does that mean, anyway? 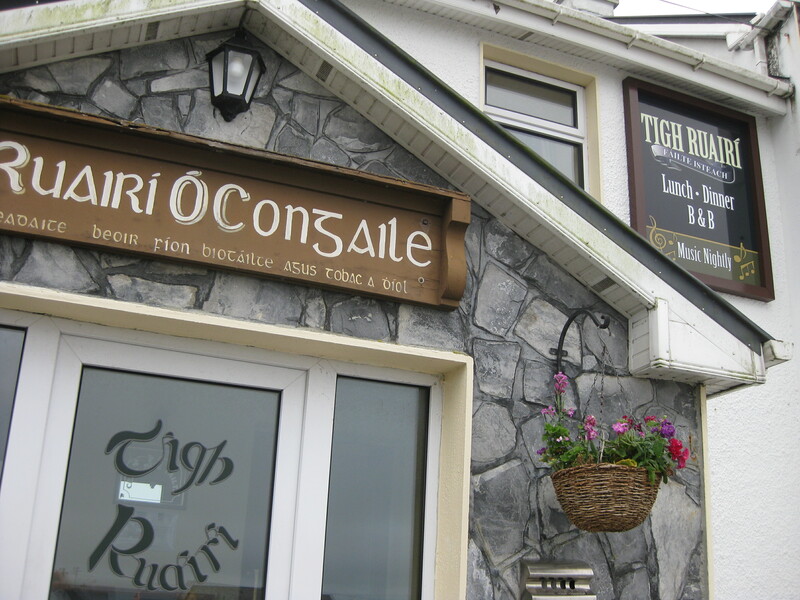 If you come to Ireland you’re going to get some…whether you like it or not. Ceol is the music. In this case traditional Irish music. You can get it in a kitchen over tea and biscuits or in a pub with a pint. Often you get it on the street for a coin tossed in a fiddle case or simply for a smile. It is everywhere, like the sound of the sea birds, the wind that messes your hair and, on this island, the lilt of the spoken Irish language. Craic? Oh, that’s another thing altogether. Hard to describe “craic” unless you are part of it. It almost always goes along with ceol and often with a pint of stout, although the new Irish consciousness about healthy living has slowed the pints a bit. A glass of fizzy water or a soft drink is just as useful when quenching the thirst brought on by enough craic. Craic, simply put, is Irish fun. It isn’t a lonely pursuit. It takes people of a like sense of humor. Last night at one of the two pubs on our little island, the craic was “up to ninety” and included plenty of music and dancing…at one point the dancing happened on a table top. Think Riverdance, Aran Island style! If you want to know more about Ceol agus craic, check out my Fadó Trilogy, starting with Butterfly and Angel’s Share. The last book in this series was released on Amazon Kindle yesterday, Selkie’s Song. I guarantee a bit of ceol agus craic! Did I say “live blog”? 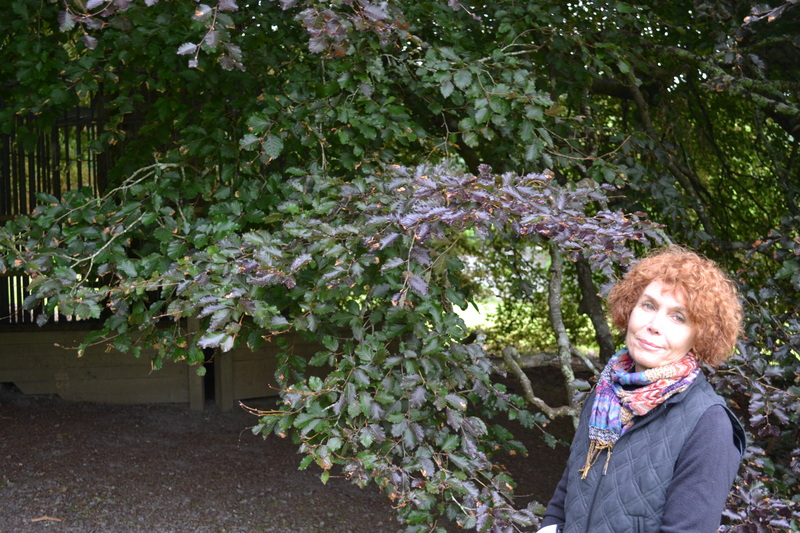 Here I am in sunny Ireland and for some reason I thought blogging would be so easy. Not from Inis Oir! This lovely island off the coast of Galway is about as isolated as one can be in the 21st. century. It is beautiful, rock covered and nearly treeless with a wide blue sky and silver seas today, but if you don’t like the weather, stick around for five minutes and it will be sure to change. There is a certain lethargy that takes over in a place like this. Life is contrasts between the rush of the world and the pull of the past. This diversity is one of the themes of my novel Selkie’s Song, available soon on Amazon Kindle. Stay tuned. Now that I have the “island internet” sorted, the idea of live blogging from the land of saints and scholars is not so daunting. The third book in the Fadó Trilogy is coming soon!